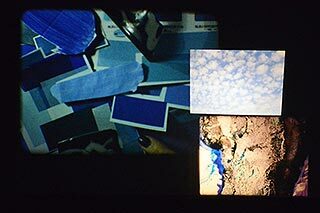 Berlin-based analog artist Deborah S. Phillips will be in attendance of this screening of three of her 16mm film performances: Capsicum, Chin-Chin and the premiere of her latest piece, T’chelet. A Q&A with Phillips will follow the screening. Phillips has been making films since 1988, and also works in other analog media, such as 35mm slide collages and handmade books. “Blue is inherently vague. Blue is associated with very different ideas in different cultures. A nearly completely black film to which the clinking of glasses in the space while the film is projected forms the soundtrack.